Limoux is a unique area in Languedoc where white grape varieties thrive. It is also the only region in France that insists on hand picking, barrel fermenting and barrel aging for AOC status whites, ensuring the highest quality. Something of a Chablis about it, this wine is rich and intense whilst still offering a wonderful freshness making for a very elegant wine. This really is a top value pick. Light gold coloured, Mandarin zest and saffron with rich creaminess on the nose. Light floral notes add elegance. Full and rounded in the mouth, baked pears and exotic spice add power but not in a heavy way. Fabulous acidity and length. 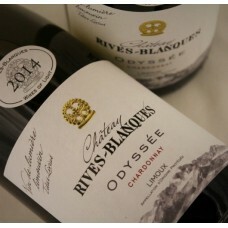 A top quality wine well suited to drinking on its own, as well as matching fine foods. It is likely to age well and add complexity over the next 3-5 years. Every cloud has a silver lining – 12 years ago Eric Vialade was faced with the prospect of selling his family winery to settle his Divorce, but fortunately along came Jan and Caryl Panman, a Dutch couple with a passion for wine and they offered an alternative solution. They took over the estate, but immediately employed Eric back as the manager and wine maker. Not only did this preserve all of Eric’s knowledge of the 30 Ha estate, but brought in new commitment and new financing to improve the cellar and drive quality. Situated at 350m amongst the trees in a designated Nature Reserve, the vines get all the benefit of Limoux’s unique climate which has given it the reputation of producing the best white wines in the south of France. This estate continues to go from strength to strength and is now turning out medal winning wines every year at what can only be described as fantastic value prices.